It has been the tale of two nights for the Washington Wizards this season. One night they knock off a just average team and the next night they fall to a team that they need to beat to earn the recognition this team surely needs heading into the second half of the season. Take tonight against the Bucks as an example, a team that has not won at Capitol One Arena since 2013. Back then it was the Verizon Center and the Wizards were still going to the playoffs the last time we checked. Fast forward to 2018 and you have a Wizards team that has had its ups and downs all season long. 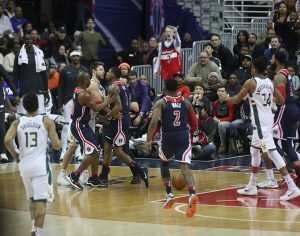 One night Bradley Beal looks like a superstar, the next night he is getting thrown to the floor in a blatant flagrant foul that almost erupted into a bench clearing brawl. Yep, that’s the 2018 Wizards. The same team that lets Giannis Antetokounmpo come into their building and take the Bucks first victory since 2013, 110-103. Another one of those nights. Antetokounmpo scored eight of his game-high 34 points in the fourth quarter and gave Milwaukee ­(21-17) the lead for good with a transition layup with 2:26 to play. Bradly Beal scored 20 points but did not shoot efficiently during a 7-for-19 night and encountered a painful moment in the fourth quarter when he was practically clotheslined by Milwaukee’s Matthew Dellavedova. With 7:24 to play, Beal was in the midst of going around Dellavedova in transition when it appeared that he was going to wrap him up, but instead pulled out a NFL horse-collar on Beal. Beal immediately popped up from the ground and confronted Dellavedova, and the benched came to the air to restrain both players. He was later after review by officials ejected with a flagrant-two foul. John Wall finished the game with 16 points and 16 assists but missed his final five shots and committed a pair of turnovers in the fourth quarter.